We are trying to sort out the arrangement of the hearth in the lounge. We need to settle on an arrangement fairly quickly as the roof starts to go on next and we need to know where the flue is going to go. The challenge here is that this end wall is very tall. We are considering internal windows from the lounge into the master bedroom – high up so privacy isn’t an issue, but it does connect the master bedroom with the other spaces. 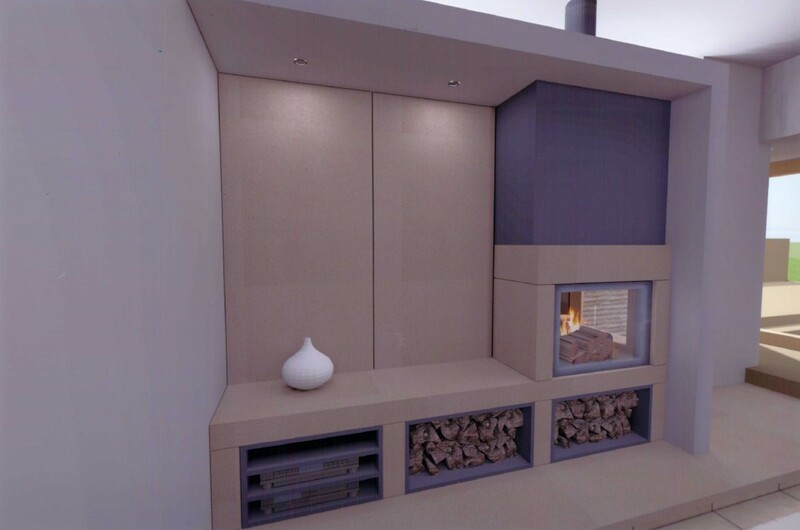 We are also looking at corner log stoves (although not shown in these pictures). While this arrangement isn’t exactly right yet, we are starting to get there (I think!). The internal kitchen wall will be built using stone that we reclaimed from a couple of internal walls that we demolished a couple of months ago. The walls (and thus the stone) was original and dates to when the cottages were first built. It is nice to think that this stone will remain on site and be re-used. The lower part of the wall is built using blockwork. This produces a flat, even surface. This will help when fitting the kitchen. The work surface has an upstand that will act as a splashback. On top of the upstand, there will be an ashlar string course. The reclaimed stone wall will then be built on top of this string course. The string course has been installed and we will start work on the reclaimed stone wall next week. Like the exterior reclaimed stone work, the internal stone work will be sand blasted before it is pointed. This will even up the finish and remove any paint or discolouring. The intention is that the internal reclaimed stone wall break up what would otherwise be a large wall. Looking from the lounge into the kitchen. 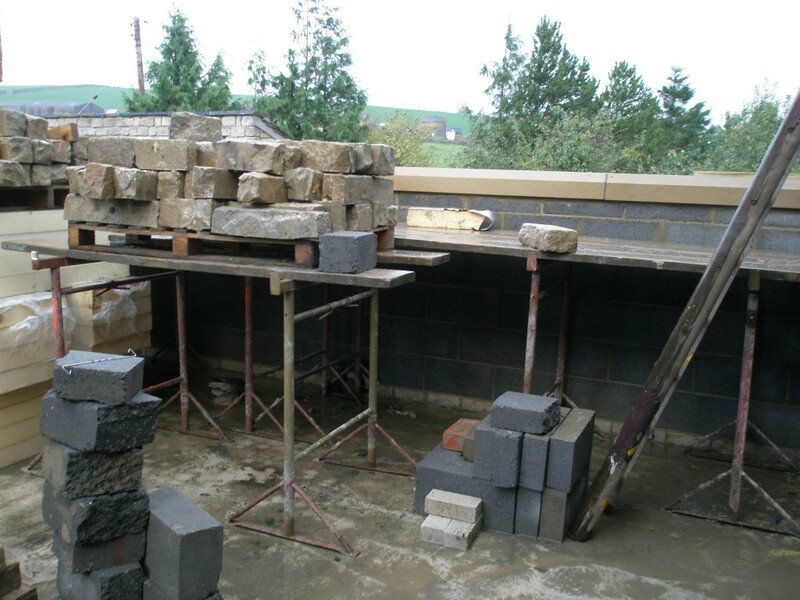 The feature wall in the far wall in the kitchen will be built using stone that we have salvaged from demolition work elsewhere on site. 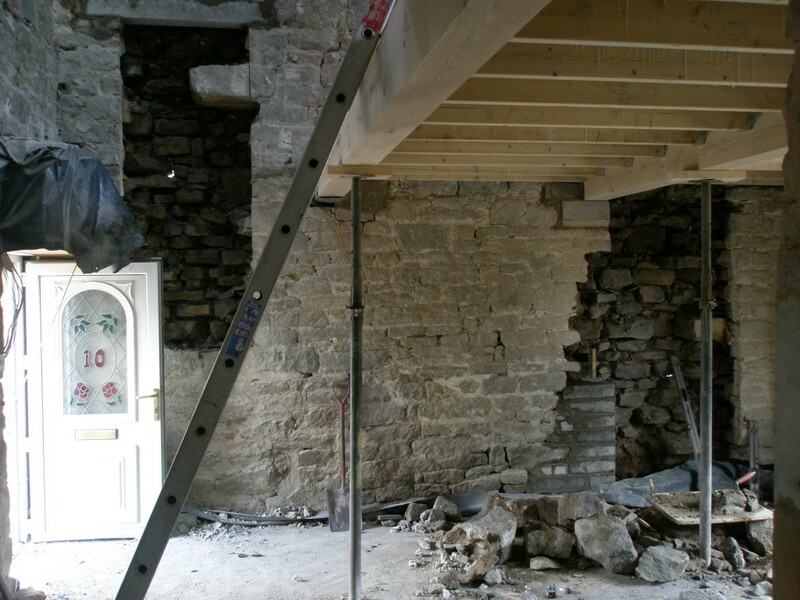 The reclaimed stone for this internal wall has come from two internal walls that were removed when rennovating the existing cottages. It is piled up here on a pallet ready to go. 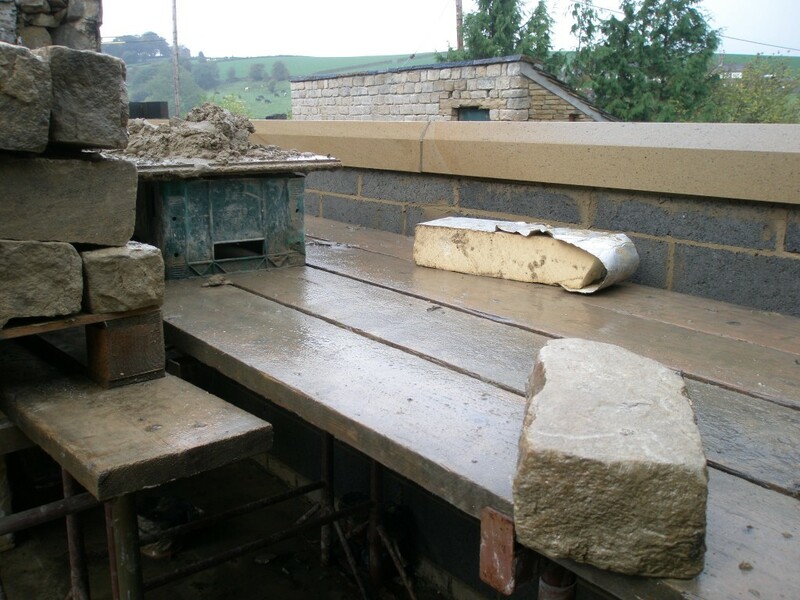 You can see here very clearly the ashlar string course that separates the upstand on the work surface from the reclaimed stone wall (yet to be built) above. 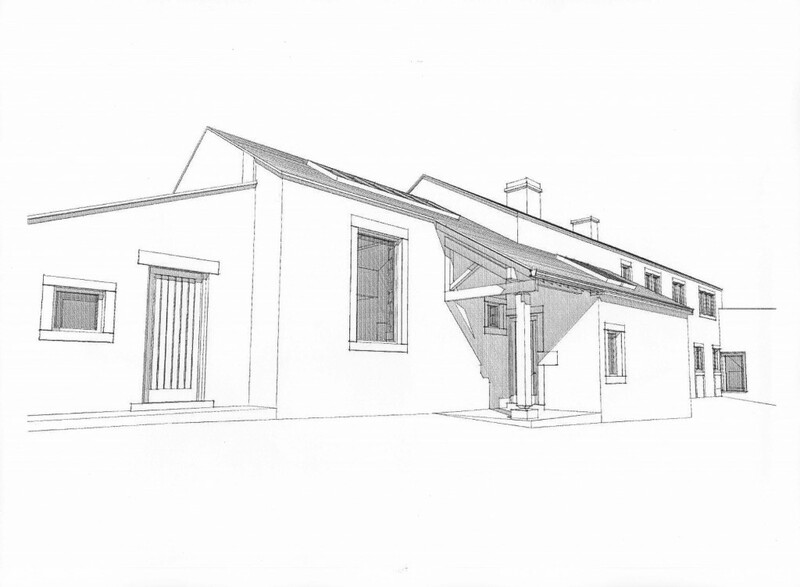 We are slowly getting around to sorting out some of the finer details of the exterior of the property. 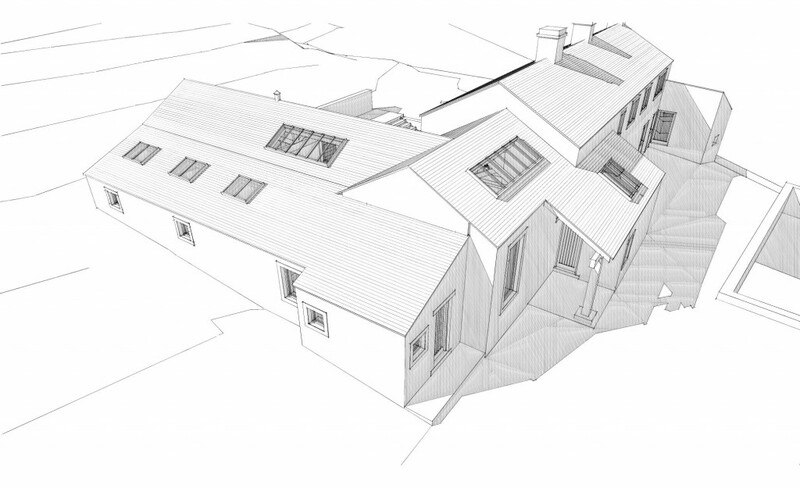 The 3D images below show the detail around the new porch and the sloping roof and post that protrudes to shelter callers from the weather. 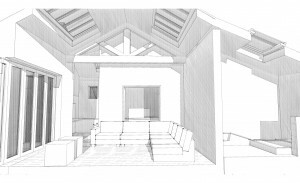 Budget permitting, this will be built in oak so that it will match the roof details inside. Close up of the new porch detail showing the oak half truss and supporting post. We have just started digging to install the second half of the ground loops and the spoil heap is pretty impressive. The top of the spoil heap is a great place to get a view of the overall state of the building work. The 3D image below, although taken from a slight different perspective, shows what the building will look like when finished. The concrete slab is due to be poured on Tuesday – the concrete pump required to pour the concrete has broken down, but has now been booked for Tuesday. In the meantime, working is progressing on installing the second half (the last 1000m of pipe) of the ground loops. This is the current view from the top of the spoil heap. 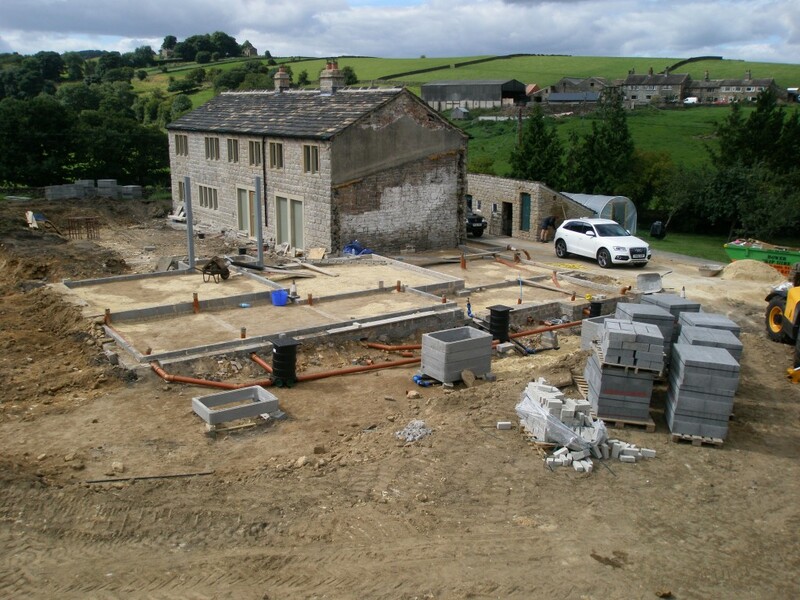 The concrete slab for the new extension is due to be laid next Tuesday. 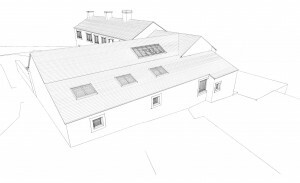 New extension to the left and the existing cottages to the right. There are three openings between the hall and kitchen. Two at ground level (an internal window and a doorway) and one upstairs (a sort of Juliette balcony from Jo’s study). We have cut the two ground floor openings. We have cut the openings using a Stihl saw and then have pulled out the masonry (but not before installing a lintel above the opening!). Using a Stihl saw is a little gentler on the wall that bashing it with big hammers and chisels. You can start to see the jumble of stones that make up the inside of the wall. It is a fairly fragile structure and needs to be shown a certain level of respect. The opening on the right is the door from the hall into the kitchen (or at least it will be!). The opening on the left is a large internal window between hall and kitchen. What you can see here is the back of the outer set of stones that makes up the wall. The three openings between the hall and the kitchen are shown here, but from the other side of the wall. The hall wall is to camera right here. With Phase 2 of the construction fast approaching, it is time to start sorting out the details of how the roof trusses and internal windows are going to work. 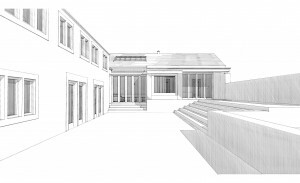 Phase 2 is the building of an extension onto the existing property and will house the kitchen, lounge, master bedroom, two en suite bathrooms, a boot room and a utility room. 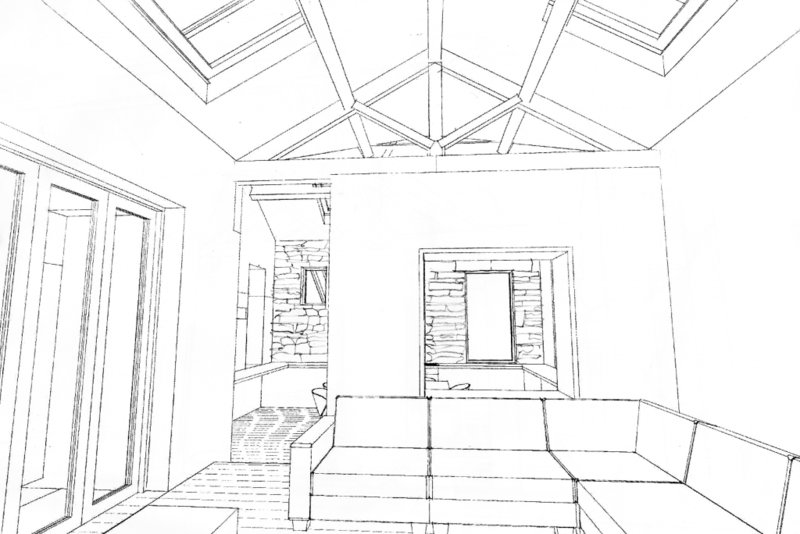 The roof line will be level, but because the ground rises up the inside ceiling height will decrease as you move through the extension. 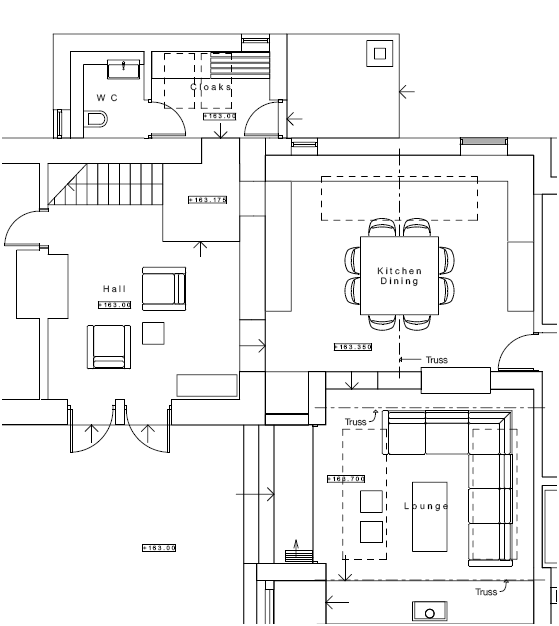 The kitchen is double height, the lounge one and a half height and the bedroom normal height. 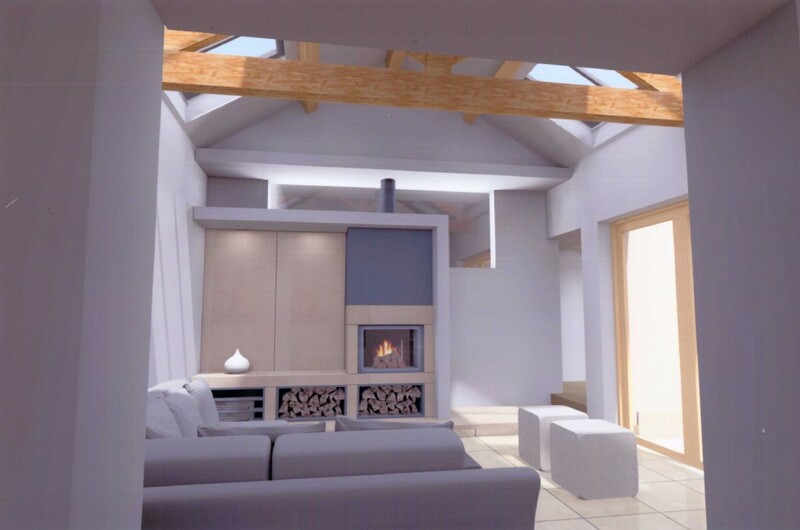 The roof trusses will be exposed as in the existing part of the property and there will be extensive use of roof lights. 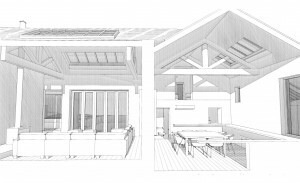 The proposal is that the roof trusses will be made of oak and made in the same traditional way (tenon joints with oak pegs) rather than using any metal plates or straps. There has been some debate about the exact placement of the beams and how “open” the space should be between the kitchen and the lounge. We have opted for a semi-open approach with a large slot for a door way and another large opening behind the seating area. The very last 3D drawing in this blog attempts to illustrate this. 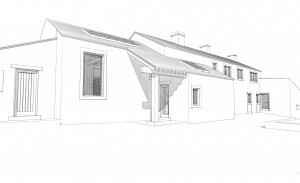 The existing cottages are on the left and the new extension with lounge and master bedroom are directly in front of us. The kitchen and lounge (but not the hall) are all in the new extension that is being built as part of the Phase 2 construction. I posted the 3D external views a few days ago, but here are the internal views. 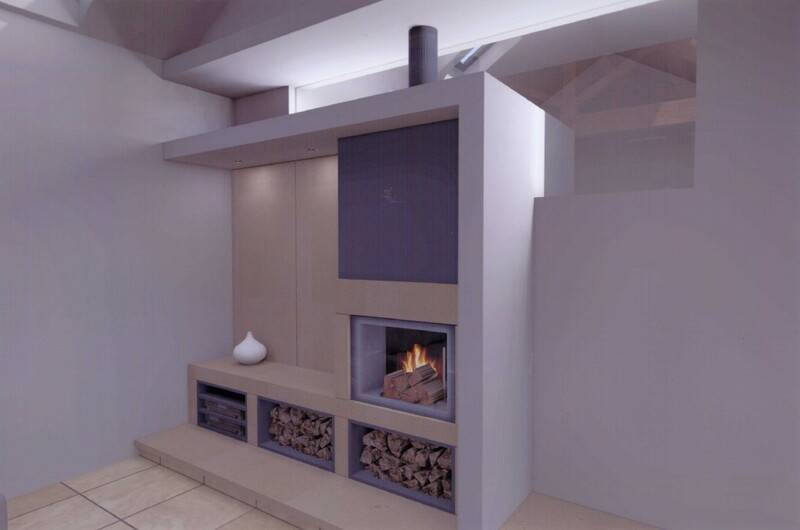 These images do a great job at providing an impression of the interior once it is finished. Again, these are the handiwork of One17Design – our architects. We have seen this view from the other side, but now the existing cottages have been removed and a section taken through the new extension. You can see how the land rises, but the roof line remains level – giving a double height kitchen, but a single height master bedroom. 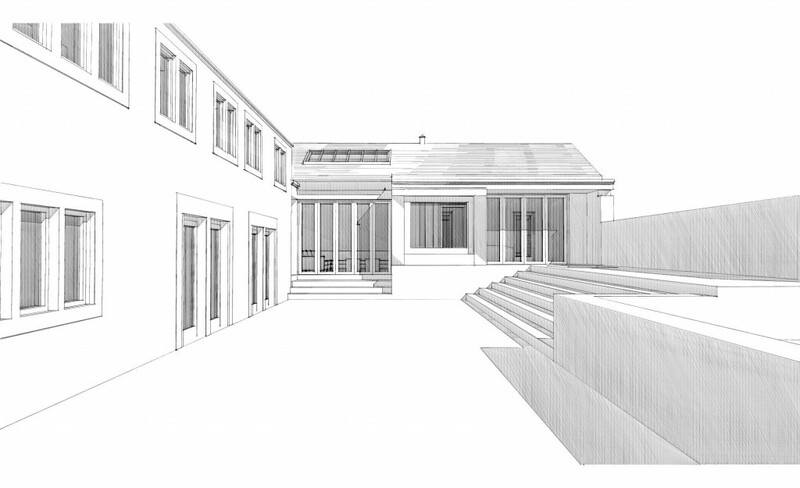 With the front of the house to camera right, this is a section through the kitchen and lounge. 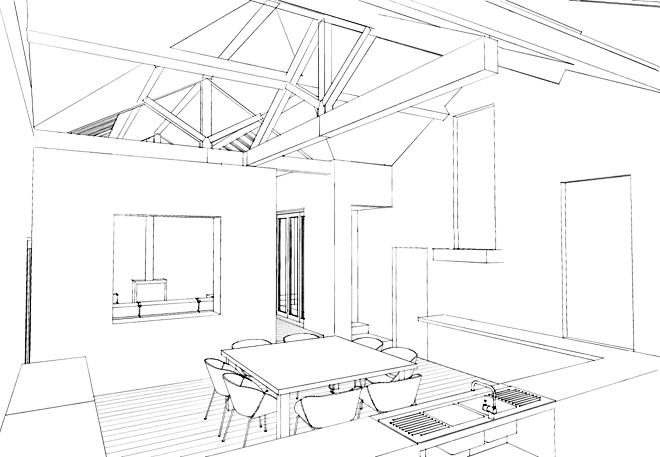 The kitchen is double height with a balcony from the office space in the existing cottage. 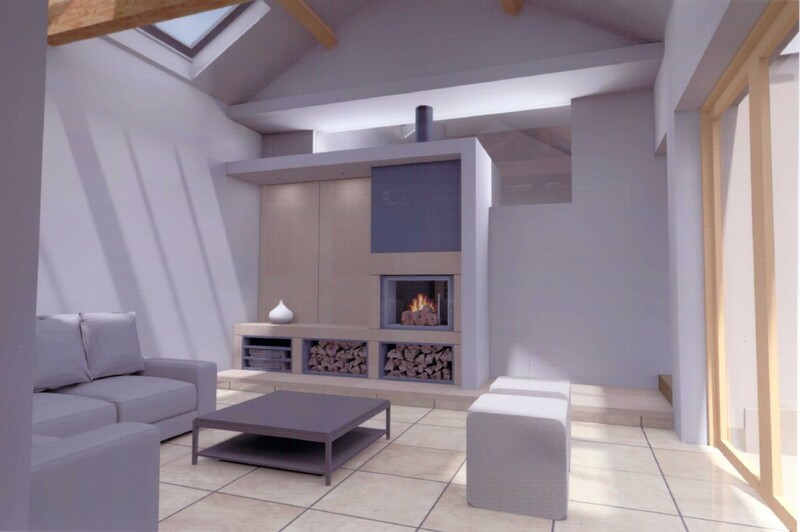 The lounge is in the new extension and is a height and a half. One of the ensuite bathrooms is shown on the far right. There is a large opening in the end wall of the lounge connecting the lounge to the kitchen. The roof trusses in the new extension are exposed. 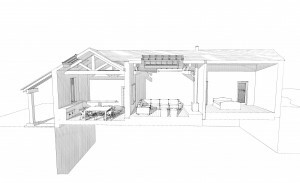 With the roof lights and large sliding glass doors, there is going to be a lot of light here. 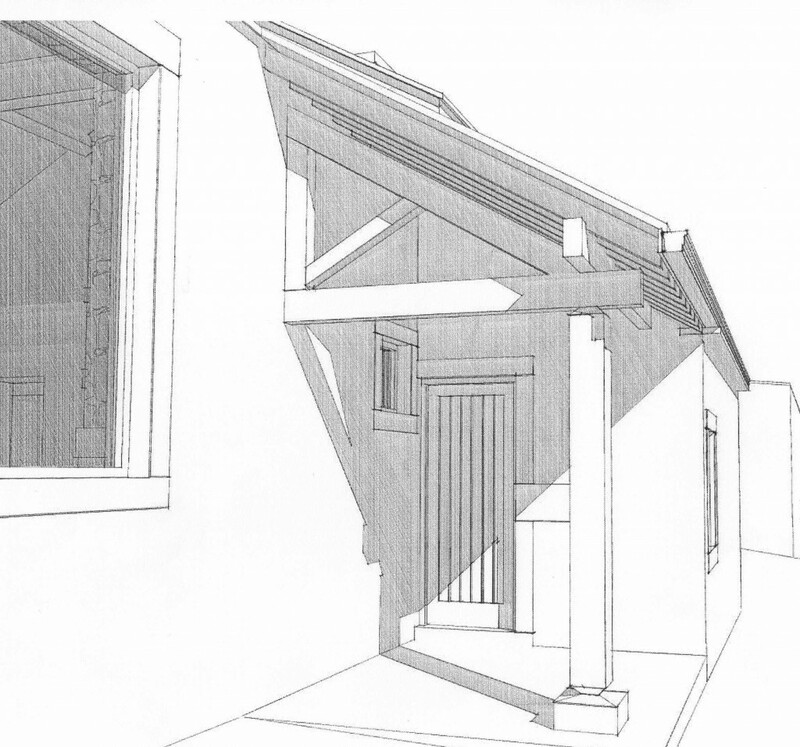 Here are some of the exterior views of the outside of the proposed property. I have posted some of these images before, but they hadn’t been updated with the amended floor plans and had been scanned from paper copies. I am still really taken with this design and the more I look at it, the more there is to see. This is the work of One17Design – I am seriously impressed. I have some internal views too and will post these shortly as well. The existing cottages plus a porch at the front. The new extension to the left. Showing the front door (under the porch) and the entrance to the boot room. To the right, you can see that the old porch has been removed and the door moved to access the office space at this end of the building. 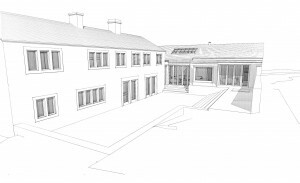 This shows the existing cottages on the left and the new extension directly in front of us. 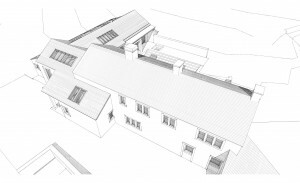 This shows the new extension to the rear of the property and the existing cottages behind.